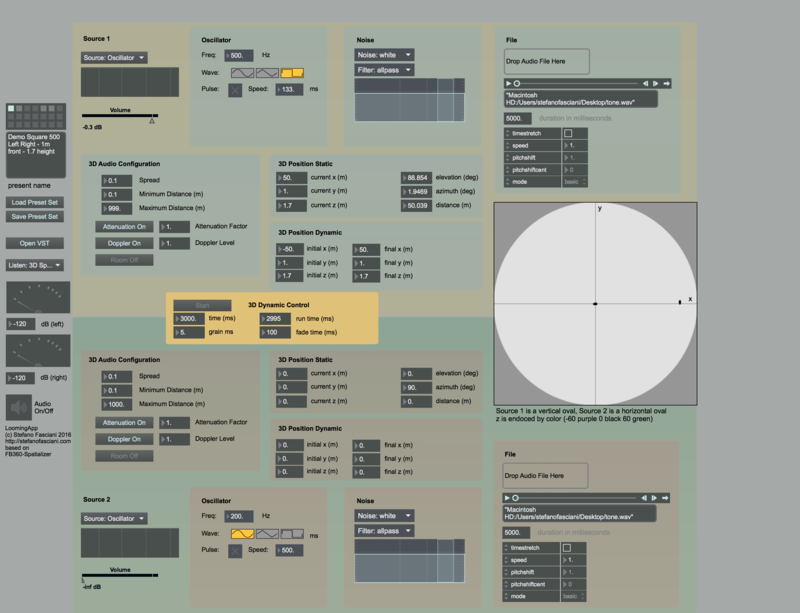 The “Binaural Auditory Looming Generator” is a Max/MSP patch that generates auditory looming. Currently it supports two linearly and independent moving sound sources and it generates binaural 3D spatial audio (use of headphones is recommended). The binaural 3D audio is generated by the Facebook 360 spatial work station VST plugins, that must be installed in the system. Supported sound sources include: continuous or pulsated basic waves (sinusoidal, triangular, square), filtered noise, wave files (with pitch shift and time stretch). Tagged auditory, binaural, download, looming, Max/MSP, moving sources, spatial audio.